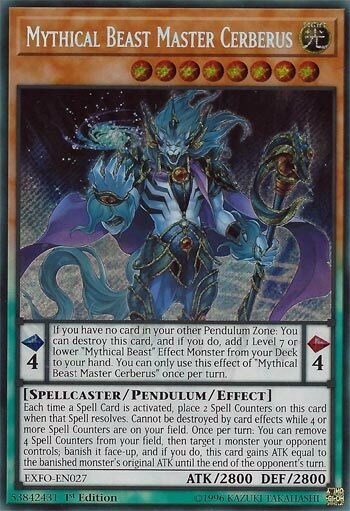 Pendulum EffectIf you have no cards in your other Pendulum Zone: You can destroy this card, and if you do, add 1 Level 7 or lower “Mythical Beast” Effect Monster from your Deck to your hand. You can only use this effect of “Mythical Beast Master Cerberus” once per turn. Monster EffectEach time a Spell Card is activated, place 2 Spell Counters on this card when that Spell resolves. Cannot be destroyed by card effects while 4 or more Spell Counters are on your field. Once per turn: You can remove 4 Spell Counters from your field, then target 1 monster your opponent controls; banish it face-up, and if you do, this card gains ATK equal to the banished monster’s original ATK until the end of the opponent’s turn. Mythical Beast Master Cerberus is the boss monster for the Mythical Beast archetype, but you could also see it along with King Jackal dropped into a Pendulum deck. As a spell, you can pop to search out another Mythical Beast that’s seven or lower, which is everything but Master Cerberus. You’ll search nine times out of ten King Jackal and use it to Special Summon Master Cerberus back. This is a great search card for the archetype, being able to search any monster besides itself for the archetype is an effect each archetype wish they had. Needing it to be the only card in your Pendulum Zone isn’t too hard to attain, just play it first and activate the effect like all Mythical Beast monsters. The monster is a 2800 beater that can become indestructible if you play two spell cards (gaining 4 counters) while it is face-up on the field. Drop four counters off the field and get a banish of an opponents monster and gain its ATK until the end of your opponents next turn is like having a next-level Honest. The ATK boost last until the end of the opponents turn, not the End Phase. 2800 is high attack as is, with even a 1000ATK monster you are near an Obelisk the Tormentor ATK. Banish a boss monster your opponent has like a BLS or a Firewall and Master Cerberus becomes HUGE. Master Cerberus has Type and Attribute support behind it, high ATK, a great effect, and awesome inherited protection. Despite the archetype not Pendulum Summoning, it can sync with other Pendulum decks and if you had the way to, could be used into other decks that don’t Pendulum Summon. I really like this card. Mythical Beast Master Cerberus is a Level 8 Light Spellcaster-type Pendulum Monster with 2800 Atk and 2800 Def and Scales of 4. Most of the stats are great, but the Scales are the worst they could be. The Pendulum Effect is a hard once per turn, but it essentially replaces itself from the field to search any Level 7 or lower Mythical Beast effect monster from your deck to your hand. The only requirement is that there is no card in your other Pendulum Zone and this card goes face up in the Extra Deck. Not bad. In addition to a good search Pendulum Effect, the Monster Effect is to be immune to card effect destruction while having 4 Spell Counters on the field. Mythical Beast Master Cerberus can generate Spell Counters 2 at a time each time a Spell Card is activated and resolved. The old Spell Counter holders used to have a cap, but Mythical Beast Master Cerberus does not. Finally, you can remove 4 Spell Counters from your field to target and banish an opponent’s monster face-up, then gain its original Atk until the end of the opponent’s turn. Targeted removal isn’t ideal, but it is better than targeted destruction. The Atk boost is really nice because of how long it lasts. If this were a Quick Effect, Mythical Beast Master Cerberus would be too powerful. If it had good Scales it would be splashed in too many decks. Instead we have a good combo extender for Pendulum decks and a good boss monster with built in protection. Own 3 forever, this card has current and future potential. Players will make nearly anything an engine if it actually helps their deck and this guy is another case of doing whatever it takes to make an engine to boost a deck, this case Pendulum Magicians. Say hello to the boss monster of the new Pendulum Spell Counter archetype, Mythical Beast Master Cerberus. Master Cerberus is a Level 8 Light Spellcaster Scale 4 with 2800 ATK and DEF. Scale is bad, but Mythical Beasts as a deck were not meant to Pendulum Summon and the engine doesn’t use this for a Scale, the type and attribute are fine, Level 8 is whatever, and stats are strong. While in the Pendulum Scale, you can destroy this card if you don’t have another card in the other scale to search for a Level 7 or lower Mythical Beast Effect Monster. The only thing this cannot grab in the Mythical Beast archetype main deck is Gazelle, which is whatever. Searching is something I will never complain about. This is a hard once per turn, but that is fine as most search effects will have that now a days. For a monster effect, each time you activate a Spell, you place 2 Spell Counters on this card. Pendulums activated in the scale are Spells, so you get the idea of the Mythical Beast deck here. While you control 4 or more Spell Counters, it cannot be destroyed by card effects. Protection is not always in a boss monster, so this one having some protection is cool. Finally, you can remove 4 Spell Counters from your field to target a monster your opponent controls, banish it, and this card will gain ATK equal to the original ATK of the monster. Nice removal effect along with an ATK boost to push for major damage. The card is great for Mythical Beasts and for the engine Pendulum Magicians run with King Jackal I believe. Run three whether it is the engine or you actually want to play Mythical Beasts. Mythical Beast Master Cerebus…let’s call him MBMC for short. Let’s see, Light and Spellcaster are both good things. 2800 attack (and defense) is awesome for a Level 8 Monster. Pendulum Scale is a 4 which is meh in my mind, but not all that bad. On that Pendulum effect, you can destroy this card if you have no others in your Pendulum Zone. You gain a Level 7 or lower Mythical Beast effect Monster from your Deck to your Hand, and said effect is only usable once per turn. The search is nice, and open for most of the cards you’ll be playing in this Deck anyway. On the Monster side, this card gets two counters each time a Magic card is activated and resolves…I feel the resolution part is a bit unfortunate, but I do rather like a card that can gain 2 counters per card like that. If MBMC gains 4 or more counters, he can’t be destroyed by card effects. By removing 4 counters, you can remove an opponent’s Monster from play (note this is a Target effect) and it’s removed face-up, and MBMC gains attack equal to it until the end of the opponent’s turn. The removal at 4 counters seems costly, and then not, as you could easily gain that many in a turn, and by your own doing. The attack increase from the second effect could be huge, but he all ready has 2800 attack, and some built in protection…it should have added trample or burn or something (which I know aren’t traditional characters of Spellcasters). Previous articleWill A Powerline Adapter Improve Your Internet Speeds?